At 78 miles, today proved to be the most physically demanding yet. 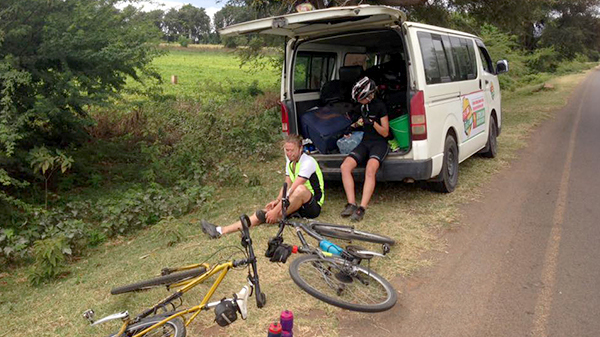 The first half was similar to yesterday – long, flat roads made worse by strong winds – and the second half drew hills that we hadn’t yet seen on the bike ride, with the exception of our climb out of the Rift Valley. We climbed over 3900ft overall and, whilst our descent was only a little less at 3500ft, you actually want some flat ground after climbing these kind of heights because the unforgiving nature of rolling hills like today’s gives you little recovery time. The day felt at times like it would not end given Francis’s (our support van driver) rather elaborate guesswork at the number of miles left to go around three-quarters of the way in. Kenyan mobile SIM cards do not work in Tanzania, so the crew – having left our Tanzanian SIM in a previous accommodation – did not have the luxury of Google maps. “In just a few kilometres” became the accidental phrase of the day. As with any other challenge on the ride so far though, it was met with good humour by the team and Francis hasn’t been able to live it down since. Having completed today’s exhaustive ride and whilst chatting over dinner, it started to sink in that we only had two days of riding left and the finish line was in sight. For five amateur cyclists taking on a pretty tough challenge, the realisation that everybody was still (relatively) fit and well seemed to lift spirits. We learned that donations were continuing to flood in and we were almost in sight of £9,000 raised in total, which is a tremendous amount and people’s generosity was not only funding a new school but keeping the team even more motivated to finish what we had started.